Since its release, the App Store has only allowed the top quality apps to pass and thus has gained a reputation for excellence. This might please the user community since they only get to use the best versions of any given app. But, it’s nothing short of a nightmare for web developers who have to invest more time in making their app reach Apple’s standards. On the other hand, apps have a very low chance of being rejected on Android. This gives the opportunity for app developers to experiment with their idea on a bigger platform. But, the problem here being that since everybody gets the opportunity to try their hand at development, there is a higher chance of buggy apps being installed by users causing security concerns. Even though Apple sees a selection of better quality apps, Android has a wider range of apps to choose from. Now, it is upto you to decide whether you prefer quality over quantity. After having developed your app in the iOS environment, what remains an issue is the visibility that your app receives. Its important that your App reaches the targeted audience. The Apple’s model provides you with a checkbox to mention all the keywords for your app, and if someone is to find it in the store, they would have to search for one of those keywords ultimately decreasing your visibility. Google, on the other hand, has a model wherein if one searches for a query it will be matched with everything from the app name down to its description much like its search engine. Google thus provides you with better visibility options so that your app find its targeted audience whereas Apple is limited in its reach. Apple believes in the policy of ‘the less the better’, with just some screenshots and bits of information scattered across two columns and if your app is paid, then finding more about it can be strenuous. The only help can come from reviews, even those aren’t updated with the changes made in the app, but even that is changing with iOS 11. Play Store provides an overall depth to your app through the help of screenshots and videos and at the same time keeping it discreet and interesting enough for users to download. Also, you get information about how other users are finding the app and you can filter comments so that you see them by the phone model comment leavers are using. You can even sort them to see the ones from your friends, so you can get a more personal endorsement from the app. Information about an app is extremely important to provide users with a pre-install notion of an app. On the iOS store, a develop has to pay a hefty amount of $100 every year for every app they publish. As a result, Apple store apps are more expensive. Also, having apps of guaranteed superior quality helps justify the inflated price tag. On the other hand, Google only charges a one time fee of $20 hence giving the freedom for Android app developers to publish as many apps they require. The atmosphere is much looser on the Play Store, and users have a much better time shopping for apps. 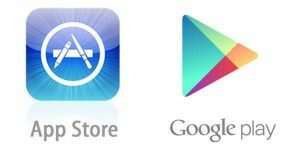 Having provided a neutral stance on Google vs Apple Store, we would expect you to consider all the aspects in mind before deciding the platform for your app.